Green Belt is srs bsns. I'm technically a black belt in Tae Kwon Do but so long out of practice and so out-of-shape I probably couldn't even get a Hap Ki Do pulled off on an errant bunny. suddenly sisters. man this will be the shock of there lifes. Yyep. No way this can end well. Unless Dave just keeps them from finding out until much much later. Aw who am I kidding, it still can’t end well. They both know karate how convenient… So who wants to bet andi and todd took these supposed karate lessons together? Really? Really? She can’t not poke at Selkie for one…darn…day? Even in the throes of joy she has to go out of her way to try to make “the fishface” feel bad? Here’s one, how crappy is Selkie gonna feel that AMANDA’s mom came back for her, especially seeing as Selkie remembers her mom? URghhhh I keep trying to remember this character is just a child, a damaged child, but she’s such a little jerk! I can’t imagine how Dave is going to play this out. Yeah but you are only imagining the fight when they find out they are sisters. we still get 3 fights for the price of one when Todd finds out Andi lied about Amanda Dying, then secretly put her up for adoption, when his family gladly would have raised her. and then a second fight when he finds out what happened to Amanda when she was in foster care. His Parental instincts will kick in and he’ll blame Andi, because Amanda never would have been in foster care if she wasn’t put up for adoption in the first place. Then the Third Fight When Amanda finds out Selkie and her are sisters, and the feelings of abandonment when her own father adopted a Sarnothi, over his own flesh and blood. there is plenty of drama to look forward too. We also get the fourth drama when Selkie worries about what to do if Selkie’s mother comes back and whether she has to leave Todd. That’s what I said on the last page! An important PSA: kids are not goods and cannot be ~damaged~. You don’t get a discount on a damaged kid. Kids are kids, and Amanda has gone through abuse and abandonment. She’s just a kid with bad temper. I understand how the word can trigger you. Speaking as someone who was a profoundly broken child, I personally didn’t take offense. I saw Leoness as acknowledging all that had been done to harm Amanda, not declaring her no longer any good. My apologies if I upset you. It’s a word I’ve used for myself many times due to abuse I went through growing up. To me it was always – I’ve been damaged but with time I’ve mended. Cracked and put back together. Damage doesn’t necessarily means damaged goods. In this sense, it’s more of a hurt, broken-inside meaning. Kind of like acknowledging that some things happened in her past that she needs to work through before she can fix her problems. Nobody here is looking at Amanda as an “object” but rather an innocent little girl with a very tragic past. Calling her “damaged” does not objectify her, but helps to underscore the fact that she needs help to heal. Ya, he’s gonna Lean Six Sigma all over her! todd is an architect. if he does park design, maybe he *does* have a green belt. As to who could beat up whom… I don’t like to speculate as to the kind of shenanigans other people get up to in the bedroom. I’m dreading what’s going to happen next. Voting is still broken for me. When the truth comes out this will be even worse for Selkie. Even though she’s Dave’s daughter now that she’s been adopted, it will hurt Selkie so much more to know she’s the only member of the “family” that’s not actually blood related. Of course, I can also totally understand the irrecoverable rift between Andy and Dave that would result when he finds out that Andy kept a living daughter secret from him all these years. you might want to amend those “Dave” comments to be “Todd”. Dave’s the creator of the strip, not the character. I doubt that it’ll be worse than Selkie because she already knows she’s not blood related and although she may not know 100% why, she DOES know that her mom loves her and had to leave for a good reason (as per the hologram from her bow). Most orphans don’t get to know why their parents left them or if it was even out of love. Plus she’s not the only member of the family who’s not related… her getting adopted by Todd is actually even MORE inclusive because his parents adopted him AND his brother & sister. So her father, aunt, & uncle are ALL adopted. If anything.. Amanda being the biological daughter will be strange. A crapstorm -is- coming, but I think it will have MUCH less to do with “I’m blood related and you’re not” (because Todd being adopted himself would NEVER treat amanda or selkie differently based on genetic relation) and more to do with a) Andi’s well-kept secret b) Todd’s ‘passing over’ Amanda for Selkie and c) The fact that two girls who absolutely hate each other will now be forced to live in a family dynamic where they’re sisters. I think that here is where Andi and Todd’s relationship will REALLY be put to the test. Hopefully they’re mature enough to deal with this though. Again, Todd had no idea whatsoever Amanda was his biological daughter. I still see where Amanda could have a hard time dealing with that, but it’s unlikely that Andi will use that argument. Exactly, and in fact the belief that his daughter Amanda died could have been a major factor, subconsciously or otherwise, in the fact that he didn’t want to adopt her. It’d have been too close to trying to replace the little girl he lost. I was never saying Todd would discriminate against her or even Andi. The only one who would maybe pack a sucker punch like that would be Amanda. However you don’t need to SAY or DO anything for a child to feel left out or sad knowing that they’re the odd one out in the family unit. When it was just Selkie and Todd that was different, but when Amanda is brought in (as she must and will be) that will add a whole different dynamic. I know Todd was adopted and yes I see that as a factor that would make Selkie feel more comfortable. In fact, we can probably recognize that Todd being adopted is why he wanted to adopt. However the grandparents are not part of the nuclear family, but a young daughter (like Amanda and Selkie) with their parents (Andi and Todd) would be. This begs the question, though — why assume Todd and Andi are going to be a “nuclear family”? I don’t think they’re going to get back together. They’d drifted apart. The mere discovery of their shared genetic kid isn’t going to make them suddenly fall in love again, and if they’re wise, they’re not going to try to move in together. Until/unless the birth certificate gets amended from “Father: Unknown” (see footnote), Todd will have no legal say in the matter, so it really is up to Andi and Amanda. Even if the birth certificate got amended, though, Todd probably wouldn’t want to push the matter much if Amanda was furious with him. Footnote: As I mentioned before, I am pretty sure that Todd can’t be on the birth certificate, or else he would’ve had to sign the surrender-for-adoption papers as well. (Or his legal guardian, if they were both 17 at the time?) Either Andi will have to do the paperwork to get the certificate amended, or Todd will need to have a paternity test done, to get him onto the certificate. Ungh, I’m sick and rambling. Sorry. Actually, Selkie won’t be the only one who’s not a blood relative. Todd is adopted—as is his brother and sister. 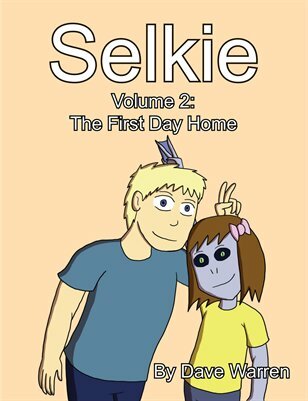 And he not only continued the tradition of adopting, but picked Selkie over Amanda. No bets on whether it will be a massive shock to find they are sisters now. The question is, implosion or explosion? Knowing those two: Hugs. Really, really tight hugs. Around each other’s necks. A hug is a great way to get your knife hand behind someone’s back. “My Dads coulds beats ups your Mom.” Isn’t that how this all started? Now, now, “knocks ups” and “beats ups” are entirely different things. Jeez, they are already squabbling like they are sisters! ….of course all the orphanage kids ARE siblings, so they have a massive head start on the reflex. I really like how Selkie starts answering the “what’d YOU do yesterday” question totally seriously. Nice touch. See, and I look at the squabbling as totally typical of those two and (hopefully) not particularly meaningful. What I got all focused on was that Andi took Amanda out and got her ears pierced, and how ‘fancy’ that must have made Amanda feel, and how it shows how hard Andi’s trying to learn her daughter and make things right. Sure, there’s a thousand ways that it could backfire, but it turned into a very sweet thing in my headcanon. Last page I said “Happy Amanda is freaking me out too.” Now I’ll tell you why. Her dancing in the lunchroom with a tray of food seemed ‘over the top’ and at the time I thought it was indicative of some mental problem she might have: When you combined that high with the lows we’ve seen I was thinking she might be manic-depressive, bipolar, or something. Now I’m thinking her dancing was a planned exaggeration for the purpose of rubbing her good mood in the faces of the others. For Amanda happiness seems to be a ‘zero-sum game.’ She can’t be truly happy unless somebody else isn’t. It’s what she knows. She’s been coping with her situation by using anger and bullying to hide her pain. Never show weakness, never show kindness. When you do something for so long it can be hard to let it go. Dave, I’m a 1st degree black belt in Songham Taekwondo! Hit me and your money will make the pain worth it. And I’m a black belt at being a big damn beast of a man. People don’t pick fights with me period. Yeah, but George’s parents are ninja astronauts, so they could beat up your parents. Ok, I guess I was wrong on Wednesday. She IS being smug. Logging a prediction for future reference, encrypted to avoid spoiling it. okay, that’s not rot13. What’s the key? Well children boasting about the power of their parents. That is certainly normal enough just so long as the parents don’t follow through in the “I am better ” department.